I bought my first Gertrude Stein book, The Autobiography of Alice B. Toklas, at the late great Smith and Hardwick Bookstore on 20th Street in downtown Birmingham in the ‘70s when I was an undergraduate at Alabama. Smith and Hardwick was one of those amazing bookstores with an outstanding jumble of books on two levels in seeming disarray. It was owned by the Praytor sisters – Virginia and Anna – and by Anna Praytor alone when Virginia died in 1974. If you were looking for a particular title in the store and couldn’t figure out where it might be in the dusty stacks, one of the Misses Praytor always seemed to know exactly where it was located. Here’s what great locally-owned bookstores were like back then: I was in school in Tuscaloosa and if there was a book I needed I would telephone Miss Anna Praytor in Birmingham. She would mail the book the same day and enclose a handwritten bill and thank you. The Autobiography of Alice B. Toklas (1933) was Stein’s own autobiography told in the voice of Toklas, her long-time companion, secretary, cook, confidante, hostess, and handler. Alice B. Toklas (1877-1967) and Gertrude Stein (1874-1946) met on Toklas’s first day in Paris in 1907 and were never apart until Stein’s death thirty-nine years later. The Autobiography of Alice B. Toklas was a huge hit and led to Stein and Toklas’s triumphant first tour of the U.S. that spanned seven months in 1934 and 1935. Stein captured the experience of the American tour and other events in a 1937 book titled Everybody’s Autobiography. Whatever else Gertrude Stein may have been, she was never modest. The carp was dead, killed, assassinated, murdered in the first, second, and third degree. Limp, I fell into a chair, with my hands still unwashed ready for a cigarette, lighted it, and waited for the police to come and take me into custody. After a second cigarette my courage returned and I went to prepare poor Mr Carp for the table. In addition to being very readable, educational, and entertaining, the Cookbook continues to inspire into the 21st Century. A brief passage in Toklas’s chapter entitled “Servants in France” about the hiring of an Indo-Chinese cook named Trac inspired the creation of a beautiful and award-winning 2003 novel, The Book of Salt, by Monique Truong. Truong’s seductive and meditative book explores a fictional Vietnamese cook, Binh, who comes into the Stein-Toklas household. No doubt the part of the Cookbook which caused the most stir is a recipe for “Haschich Fudge” in a section of the book called “Recipes from Friends.” The marijuana brownie recipe “which anyone could whip up on a rainy day” was given to Toklas by Brion Gysin and is described as “an entertaining refreshment for a Ladies’ Bridge Club or a chapter meeting of the DAR.” The chapter of recipes from friends was inserted to fill the book out and Toklas might have been clueless about what she was presenting with the fudge recipe. Even so, the American publishers left the recipe out of the first American edition but it was included in others and became notorious and sort of a code, especially when the hippie movement of the 1960s took hold. Break 8 eggs into a bowl and mix them well with a fork, add salt but no pepper. Pour them into a saucepan – yes, a saucepan, no, not a frying pan. Put the saucepan over a very, very low flame, keep turning them with a fork while very slowly adding in very small quantities ½ lb. butter – not a speck less, rather more if you can bring yourself to it. It should take ½ hour to prepare this dish. The eggs of course are not scrambled but with the butter, no substitute admitted, produce a suave consistency that perhaps only gourmets will appreciate. I am no gourmet, and this recipe is too rich to serve a lot, but I have prepared it and can attest to the fact that it is delicious. In 1963, needing money, Alice B. Toklas finally got around to writing her own autobiography. It is called What Is Remembered. Even though she outlived Gertrude Stein by over two decades, she chose to end her own life’s story with the death of Gertrude Stein. This entry was posted in Alice B. Toklas, food, Gertrude Stein and tagged Alice B. Toklas, Birmingham, culture, Eugene Walter, food, Gertrude Stein, literature, memoir, Monique Truong, recipes, Smith and Hardwick Bookstore, The Alice B. Toklas Cookbook, The Autobiography of Alice B. Toklas, The Book of Salt, Virginia and Anna Praytor on February 4, 2015 by gedwardjourney. 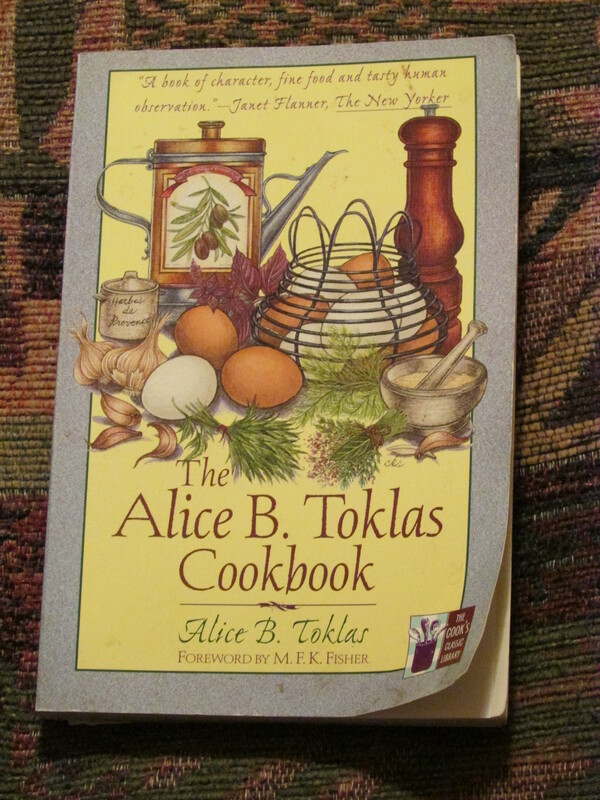 Very interested to read your post on Alice and her cookbook. I too am fascinated with her and recently wrote about her cookbook on my blog. I had only read the abbreviated version of her cookbook (“Murder in the Kitchen”) then but now have the full, original version and am impatient to read it all!